Ondo State Governor, Oluwarotimi Akeredolu has admonished corps members who will be serving in the state for the next one year on the need to uphold the selfless pursuit of their predecessors at ensuring a better society. The Governor who stated this on Tuesday at the Terminal Parade of Batch A corps members at the NYSC Permanent Orientation Camp, Ikare-Akoko in Akoko North East Local Government Area urged the corps members to shun acts capable of undermining their service year in the state. 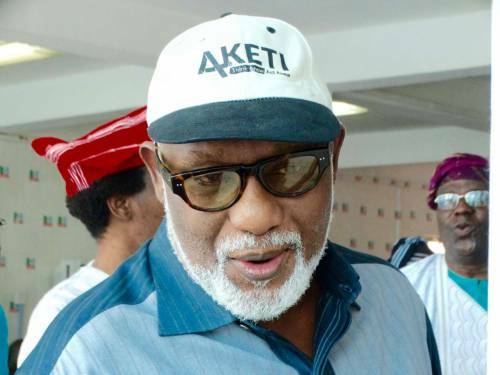 Akeredolu who was represented by his Deputy, Hon. Agboola Ajayi told the corps members to thrive at making their stay in the state worthwhile through fruitful engagement with their host community. He also assured on the continued security and welfare of corps members deployed to the state, adding that their welfare would receive utmost attention. “The orientation is primarily meant to equip you in order to have a better understanding of rge operations of the scheme. It is also to toughen and prepare you physically and mentally to meet the challenges ahead, especially in your new found culture and environment. “The NYSC, in its struggle to ensure national development, has been instilling the value of patriotism, integrity, hard work, unity amongst corps members during the orientation exercise. “In addition, values that will always come handy during and after your service year have been entrenched in the course of contents. “I encourage you to contribute to the socio-economic and political development of Ondo State, as you are the hope this country has. Strive to put in your best and contribute productively in whatever sector if the economy you might be posted,” he said. Also, the State Coordinator, NYSC, Mrs Grace Akpabio who appreciated the state government for its support always, advised the corps members to be good ambassadors of the scheme irrespective of their Place of Primary Assignment, PPA. Meanwhile, a minute silence was observed in honour of Ibrahim Okanlawon, the corps member that lost his life in a boat mishap at Agadagba-Obon in Ese-Odo Local Government Area of the State during the March 12 State House of Assembly election.